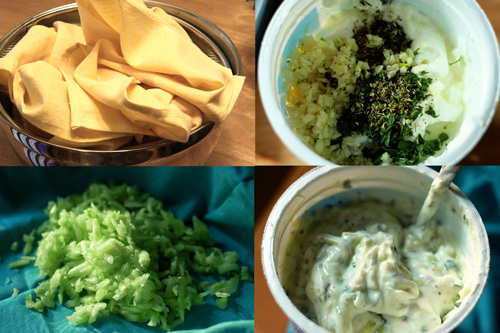 A friend of mine who tried my tzatziki for the first time once said, “Man, that is some good sh.. er stuff!” Use it as a dip for vegetables or pita chips, a spread for toasted French bread slices or pumpernickel chunks. And last but not remotely least, use it as a dipping sauce for souvlaki or to top a souvlaki pita. Definitely good sh.. er stuff. Greek-style yoghurt is thicker and tangier than plain yoghurt and works best for this recipe. I can’t get it for a reasonable price where I live, so I use whole milk yoghurt instead. My mother would use goat’s milk yoghurt when she could get it. If you are using the whole milk yoghurt, strain it through a linen towel (I’ve read that some people use coffee filters) set over a strainer for about 3-4 hours. This thickens it up nicely. Strain the yoghurt in a colander lined with a linen towel and set over a bowl for 3-4 hours (overnight is fine) in the refrigerator, covered with plastic wrap. Peel and seed the cucumbers. Grate them coarsely and then squeeze out the excess water using another linen towel. Add the cucumbers and the remaining ingredients to the yoghurt, mix well and refrigerate at least a few hours or overnight to meld all of the flavors. I keep and reuse the original yoghurt container to mix and store my tzatziki. 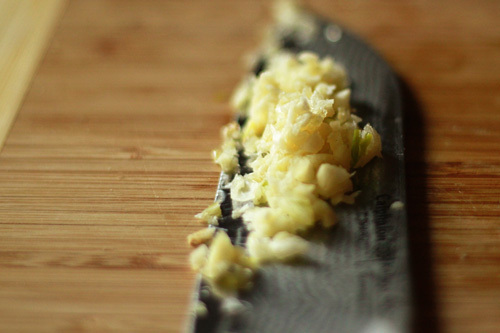 Taste for seasoning both before and after the refrigeration period. Be careful with the garlic; the flavor of it tends to get stronger as it sits, and can become overpowering if you use too much. Use less than you think you should when you are making this for the first time. Never thought to try to make this at home. Always just enjoy it at our favorite Greek restaurant. Looks yummy! I’m loving the presentation .. this is so pretty!! where is this dish from ..is it generaly greek or is it specific to an island ? this is new to me and I must definetly try it ! I never tire of Tzatziki. It’s delicious on so many vegetarian dishes and even just spooned onto warm bread, crackers, or pitas. Yours looks delicious. 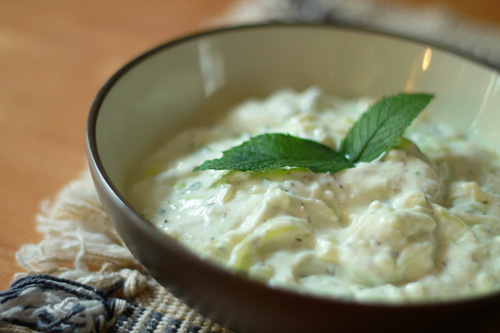 Tzatziki is a wonderful fresh, zesty dish. Try dropping a spoonful onto a fresh oyster with a squeeze of lemon. It’s delicious. I agree with the garlic use, keep it subtle. I add fresh ground black pepper as a garnish over it in the bowl as a dip. Delicious with celery sticks as well as on top of a halved and ripe cherry tomato. I’ve bought this at the store and had thought about making it myself, so I’m happy to find your recipe. Thanks! I use it as a vegetable, cracker or pita dip.